Saint Leonid of Ustnedumsk lived in the Poshekhonsk district of Vologda, and he was a farmer by occupation. At age fifty, he saw the Mother of God in a dream, who directed him to go to the River Dvina to the Morzhevsk Nikolaev Hermitage. He was to take from there the Hodegetria Icon of the Mother of God, and build a church for it at the River Luz and Mount Turin. 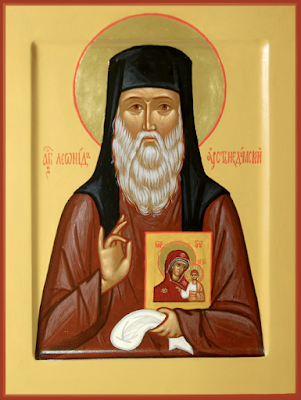 The miraculous vision was repeated, and Saint Leonid was advised not to oppose God’s will. The venerable one then set off to the Morzhevsk Hermitage, and after a year he told Abbot Cornelius (1599-1623) about the command of the Mother of God. Having received from the abbot both a blessing and the Hodegetria icon, the monk reached the River Luz near Mount Turin, 80 versts from the city of Ustiug, and he built himself a hut from brushwood. The local people, fearing that their land would be taken from them for the Saint’s monastery, compelled him to resettle up the river in a marshy wilderness spot. With the blessing of Metropolitan Philaret of Rostov (afterwards the Patriarch of All Russia, 1619-1633), Saint Leonid was ordained hieromonk in 1608. 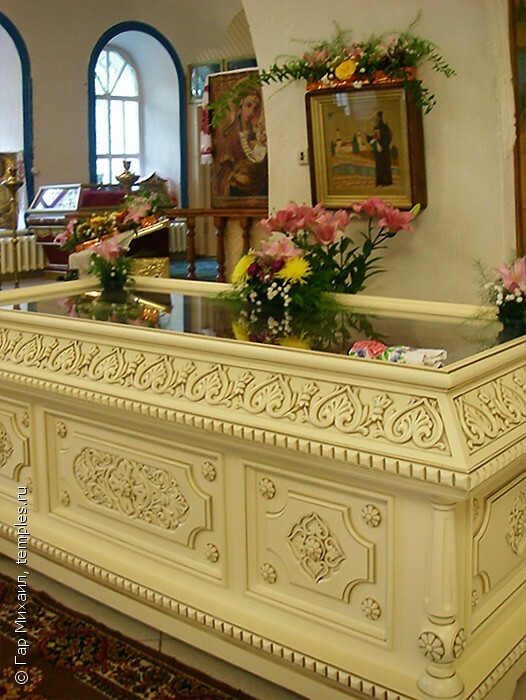 In the newly-built church in honor of the Entrance of the Most Holy Theotokos into the Temple, Hieromonk Leonid installed the Hodegetria icon, as the Mother of God commanded him. Because of his difficult labors on the frontier, called the “Luzsk Permtsa”, which means “the pocket-land of the wild Permians”, it is fitting that Saint Leonid is venerated as one of the first enlighteners of these remote lands. The monk had many struggles with the severe and inhospitable forces of nature. Although his canal-system had drained the marsh, in times of floodings the River Luz engulfed the monastery. Towards the end of his life the tireless worker undertook construction on a point of land at Black Lake. At the new site a church was built and consecrated in 1652. Saint Leonid died at age 100, on July 17, 1654. He was buried at the monastery church, where for a long time his coarse and heavy hair-shirt was preserved, a reminder of the ascetic toils of the holy one.